This year marks 12 years since UPSI began working in partnership with the London Borough of Sutton to help understand the security perceptions of local people. Since 2007, the institute has helped to deliver an annual community engagement exercise using its bespoke SENSOR methodology. Integrated: used by neighbourhood police officers as an integral part of their community engagement role. In the London Borough of Sutton, SENSOR interviews are conducted by police and police community support officers from each of the Borough’s Safer Neighbourhood Teams. UPSI staff deliver one day’s training covering the background to SENSOR, the identification of signal crimes and disorders and operating the SENSOR tablet application. Interviews are conducted ward-by-ward on a rolling basis between April and July each year over a period of 14 calendar days. The data collected is returned to UPSI where analysts produce community intelligence reports for tactical use by each Safer Neighbourhood Team, together with a strategic borough-wide report which feeds into the Safer Sutton Partnership Service’s National Intelligence Model compliant annual Strategic Assessment. At a borough level, these data have help to understand the changes in its crime and disorder profile over time and have informed the ‘bending’ of police and local authority resource across the area to the things that matter most to people. Understanding the community impact of identified problems and incidents has also enabled the Partnership to access other sources of funding to improve its management of community safety. At an operational level, Safer Neighbourhood Team sergeants are tasked with reviewing their community intelligence report prior to developing and owning an annual ‘SENSOR Action Plan’ covering key problems and locations in their area. Team resource allocation is driven by issues identified in their plan, with officers tasked to patrol SENSOR ‘hotspots’ when they have no other priorities to attend to. 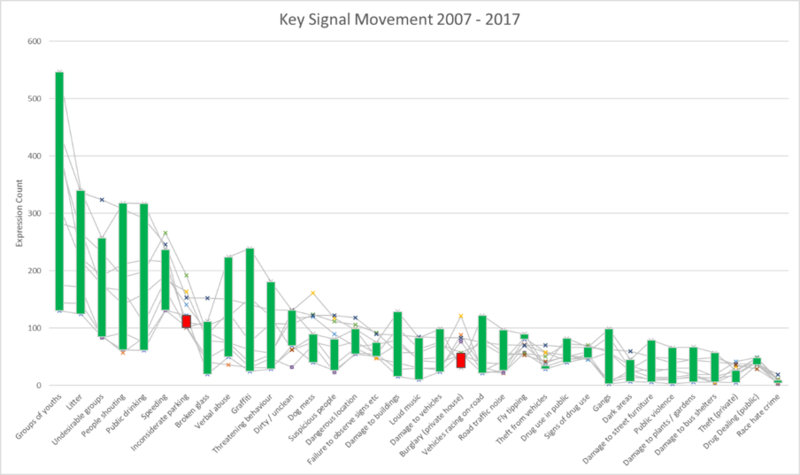 Over 12 years the Sutton SENSOR exercise has resulted in a unique and significant longitudinal dataset. Whilst the borough’s crime and disorder profile has remained remarkably similar over that time, relative volume has decreased suggesting by ‘gripping’ problems and places at a local level, policing interventions can make a difference. Public confidence has increased as crime and disorder declines, even when only limited traction is gained over some of the more entrenched social problems, indicating that the process of engaging and ‘being seen to be trying’ to address priorities is important in influencing perceptions.